Literary Hoots: Hotel Bruce Book Birthday and Prize Pack GIVEAWAY! Hotel Bruce Book Birthday and Prize Pack GIVEAWAY! Minor update: For anyone that is checking back because they wondered "what the heck" when entering the giveaway. Initially I had the option for commenting on the blog post as another entry into the giveaway and only now just realized that I had turned off the commenting option on my blog posts... Everyone has their dumb moments, right? So now that option is completely off the books; sincerest apologies for the confusion. The giveaway will keep going as planned! My favorite lovably grumpy bear is here! 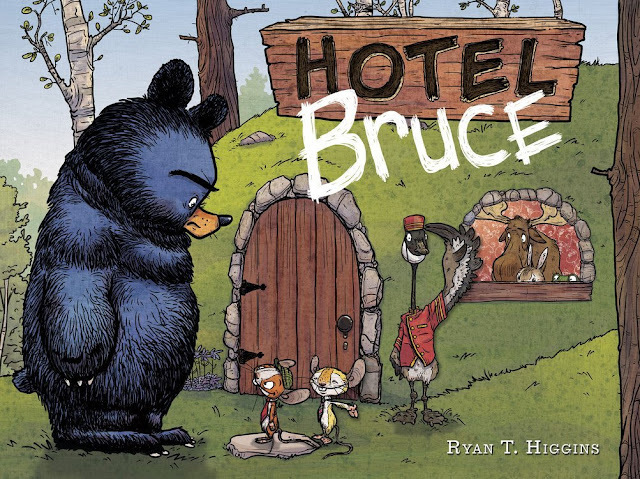 Yep, Hotel Bruce is on sale today and I hope you are all excited about it. If you haven't already got yourself a copy, I guess I can forgive you, because you are in the right place. Thanks to Disney-Hyperion, I have a prize pack to share with you that includes a copy of the book AND a pretty dang cute "Wipe Your Paws" welcome mat. Oh, yeah! Enter using the Rafflecopter widget below. If you still have no idea what I'm talking about, check out my review of the book back here, and then read on, MacDuff! "When Bruce gets home from a southern migration trip with his goslings, he is tired. He is grumpy. And he is definitely not in the mood to share his home with the trio of mice who have turned his den into a hotel. "There's a possum pillow fight wreaking havoc in one room, a fox luring guests into a stew in the kitchen, and a snuggly crew of critters hogging the bed. Bruce growls and grumbles and tries to throw them all out, but the entrepreneurial mice just can't take a hint. Bruce is in a little over his head, especially once the goslings join the staff. Will this grumpy bear ever get his quiet, peaceful den back to himself?" Ryan T. Higgins (ryanthiggins.com) is the author/illustrator of Mother Bruce. He does NOT live with four geese, but he and his family do live with a tortoise and a menagerie of other pets. At one time or another, Ryan has been friends with a porcupine, a raccoon, a beaver, dozens of mice, and a couple of squirrels, but he has never found a moose in his bed. He always peeks under the covers, though. Check in with Bruce at books.disney.com. Follow Disney Books on Twitter and Instagram. ...So is your interest piqued yet? Without further ado, the giveaway! Enter below! Open to the US only, ends 10/28/2016. No purchase is necessary. Void where prohibited. I and the publisher/publicity department are not responsible for lost, stolen, or damaged items. If you are under 13, please get a parent or guardian's permission to enter. Winner will be chosen randomly via Rafflecopter after the contest ends. Winner will have 48 hours to respond to the email, otherwise, we will pick a new winner.